Open Apple Mail and click on ‘Mail in the menu bar. Click on ‘Preferences’. 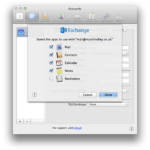 A dialog box will appear, listing all the email accounts which are active on your Mac. Click the ‘+’ symbol in the bottom left of the dialog box. Choose Exchange from the types of account available. You may get a security certificate error. A dialog will appear to confirm your settings have been found. Choose which service you want to synchronise. That’s it. Your new account is listed and you can change settings here if required.